Blackmagic Design has announced that China’s Anhui TV designed its first 4K OB van with Blackmagic Design 12G-SDI products, including URSA Broadcast cameras, ATEM 4 M/E Broadcast Studio 4K, ATEM Television Studio Pro 4K, Smart Videohub 12G 40×40, HyperDeck Studio 12G and various converters and monitoring products. 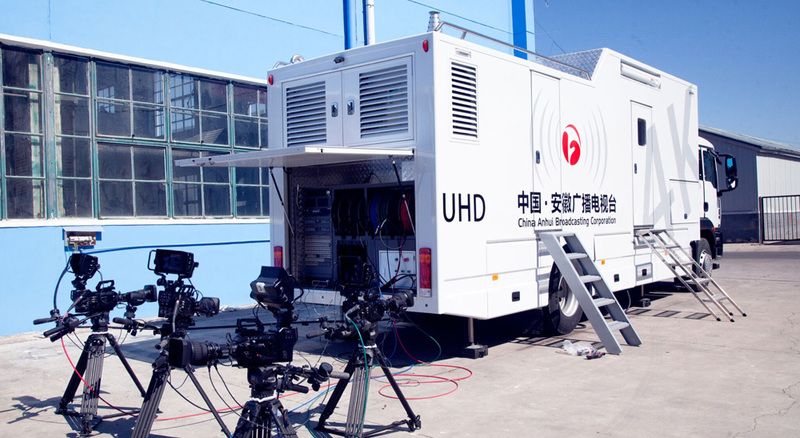 The OB van was outfitted by OB van builder Beijing Huanda Automobile Assembly Co., Ltd.
China Media Group and Guangdong TV is launching China’s first two 4K channels in October 2018 and China’s broadcast industry has been proactively building integrated media infrastructures responding to the media convergence tendency. To prepare for the future 4K and integrated media live production challenges, Anhui TV decided to build their first 4K integrated media OB van that supports new media technologies and traditional broadcasting methods including satellite, cable, terrestrial, and digital radio. This OB van includes four URSA Broadcast cameras with SDI video output embedded with audio, tally and talkback from each URSA Broadcast converted by a Camera Fiber Converter on the back of the camera to optical fiber. Signals are then sent along a single SMPTE fiber cable to a Studio Fiber Converter on the OB van, which converts it back to two SDI feeds, with one going to the main ATEM 4 M/E Broadcast Studio 4K and the other going to a Teranex Mini Distribution. The Teranex Mini Distribution splits the signal to five SDI inputs going to the backup switcher ATEM Television Studio Pro 4K, Smart Videohub 12G 40×40, SmartScopes 4K and a connection panel. For incoming feeds different from the project format, six Teranex AV standards converters are installed to convert the feeds before sending them to the router. Some more Teranex AVs are used to convert programs from switchers to standards transmitters support when needed. Also integrated into the OB van are Blackmagic Multiview 4, Multiview 16 and SmartScopes 4K and SmartView 4K for video monitoring. Programs are recorded onto a HyperDeck Studio 12G recorder while a Blackmagic Audio monitor 12G is used for audio monitoring and DaVinci Resolve system is available for quick postproduction if necessary. ”This OB van will be mainly used for breaking news live broadcasts. That means it has to be reliable and efficient,” said Luo Xiaobin, deputy section chief of transmission section of master control of Anhui TV, who was in charge of designing and building the OB van system. He explained why they decided to choose Blackmagic Design’s 12G-SDI workflow for the OB van. Their experience with Blackmagic products in the past also gave them confidence. Luo noted that, in terms of reliability of a large broadcast system, no product is 100% reliable even when it’s the most expensive device, and you must have backup components for redundancy. The versatility of Blackmagic products was helpful for the OB van system design. Luo said: “Almost every Blackmagic product is like an all in one product. Let’s take the ATEM switcher for example. Each of its inputs includes a frame synchronizer and the switcher itself supports audio embedding and de embedding. Plus, the switcher even has a built in audio mixer. That allowed us to simplify the system, meaning the number of points of failure was reduced and the reliability of the system was further enhanced. Luo thinks compared to traditional broadcast products, Blackmagic products are simpler, more practical and intuitive. “Most of our work is doing breaking news. The simpler the equipment, the more efficient the crew and the smaller chance of making mistakes.” he said. Building the 4K OB van with Blackmagic Design’s 12G-SDI workflow, Anhui TV has found a new way of building integrated media production infrastructures through their exploration of new technologies. “In the broadcast industry, the people are the most important factor that drives the industry forward. Only if the people are curious and hungry for new products and technologies, they will proactively try something new. Through building this OB van, I feel it’s worth studying Blackmagic products more deeply. The deeper, the more creative you will get, which gives you more inspirations and simpler ways to achieve your design goal,” Luo concluded.